This converted farmhouse has been renovated tastefully, leaving its original old features intact, thus retaining its appeal and rustic architecture for the enjoyment and discovery by the younger generation. Property is equipped with all modern amenities for a comfortable complete holiday. The entrance, with its imposing stone arches leads to a limestone staircase and two ground floor bedrooms, one double and one twin. A family bathroom completes this floor. Once up the wide limestone staircase, the floor opens to a wide living/dining/kitchen area. Large shutter-style windows open out to the pool, bringing Ta Rena’s spectacular views indoors. A double bedroom with ensuite and a family bathroom complete this floor. Use of Air-condition units are available in all bedrooms with an electronic coin system (€1 & €2 coins) installed at property with a screen to display the credit remaining, each AC unit consumes around € 2 per night. *Closest supermarket is 450m from property. 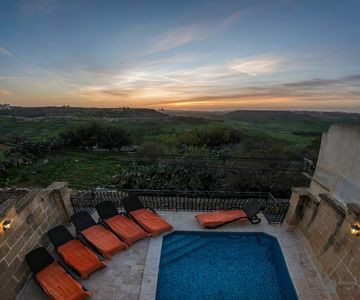 Nadur is situated on the easternmost hill of the small island of Gozo, Malta's sister-island. Nadur, a lofty, lookout plateau, has a population of around 4,000 people which makes Nadur one of the largest localities in Gozo. The feast of Nadur ""Mnarja""is celebrated on the 29th of June and by the 1720's a beautiful area known as ""Il-Buskett"" (meaning little forest) was the site of the celebrations. The feast was very popular with honeymooners and it's name seems to suggest that there is a possible connection with the beginning of Summer. It is derived from luminaria (illumination), and in fact it is a festival rooted in Maltese seasonal rituals and customs. A fully refundable security deposit of Euro 200 is required at check in, from a valid credit card (Visa or Master Card only).